Because Smith is a women’s college, women become leaders; they get the habit of success. Overwhelmingly, young women choose Smith for its academic excellence and reputation as an outstanding top-ranked liberal arts college. They also come to Smith to learn to be active thinkers and leaders, to discover their own talents and intellectual strengths, and to learn how they can someday make a difference in the world. Smith’s open curriculum, based in the humanities, arts, social sciences and the natural sciences, promotes a vigorous culture of scholarship, inquiry and discovery. Your daughter may choose to explore many fields of knowledge, and she will have help from academic advisers in shaping her own education in an intentional way. She will select her classes from more than 1,000 courses at Smith and an additional 5,000 undergraduate courses offered at four nearby campuses—Amherst, Hampshire and Mount Holyoke colleges, along with the University of Massachusetts. These institutions have joined with Smith to form one of the oldest, most highly regarded consortiums in American higher education. 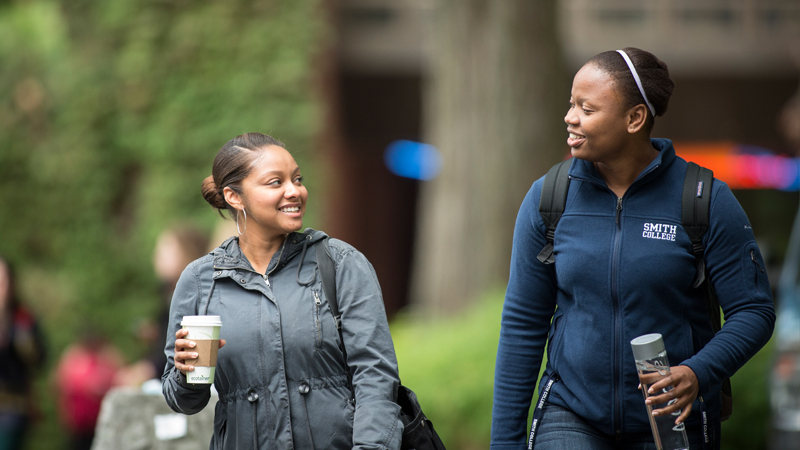 Learn more about the benefits of a women's college. Will Your Daughter Fit In? The best way to discover if a college really fits your daughter—and your expectations—is to visit the campus. Are people friendly and welcoming? Is there a diverse student population? Applicants and new students frequently comment on Smith's inviting atmosphere, and many say they immediately fell in love with the campus on their first visit. As soon as new students arrive on campus, Smith's preorientation and orientation programs help them feel at home. At Smith, students join a legacy of women with the confidence to step up, speak out and lead positive change in the world. Students can broaden their experiences through lectures, performances, athletics and social gatherings throughout the Five College campuses. Students pursue exciting careers: Employers seek liberal arts graduates because they excel in communicating and critical thinking.